Architectural designers can help take you through the right process to create your dream loft conversion. It takes times but it will be worth it in the end. 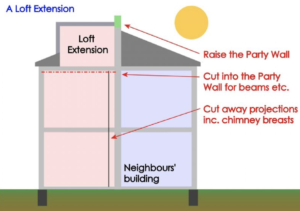 Here we outline the schedule of the loft conversion process from beginning to end. Can your home can take the weight of a conversion? Is there enough head height? 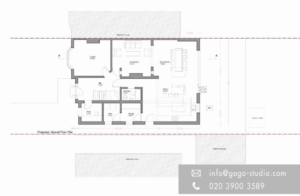 Is there enough space and do you need planning permission? These are a few factors that needs to be addressed before starting a loft conversion. The easiest way to check is to see if there are other similar loft conversions on your street. As most houses on the same street have similar structures, it is highly unlikely that you wouldn’t be able to do the same conversion as well. Since a loft conversion would add more weight to your house, it’s important to ensure the structure of your home can take the extra weight. Checking this early is a good idea. If it turns out that your house cannot support it, then underpinning may be needed to support the extra weight, which could increase your costs. Another factor to check is whether there is enough head height and your roof structure. 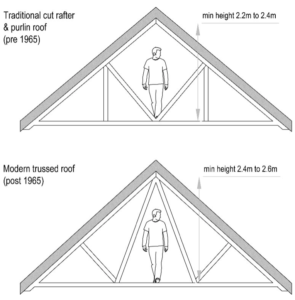 If your roof is a traditional cut rafter or a purlin roof (built before 1965), the minimum height for a roof is between 2.2 m and 2.4 m. If your roof is a modern trussed roof (built after 1965), the minimum height is between 2.4 m to 2.6 m.
Finally, it’s important to think about if the space can be turned into suitable and usable room(s). If it is too small, then it might be better to look into other home renovation ideas. 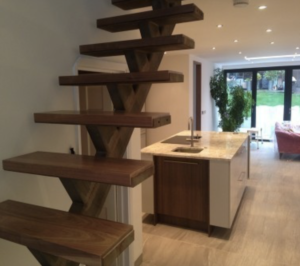 Take into consideration that you would need to accommodate a staircase that would lead up to the loft, as well as space to put water tanks, plumbing, heating and the hot water system if adding a bathroom. The great thing with loft conversions is that it opens up more space in your home to with as you want! Once you know you are suitable for a loft conversion. the fun part begins. A good place to start is by brainstorming ideas on how it should benefit your everyday living. An architectural designer will help discuss the technical aspects of your build as well as help discuss some exciting new ideas for your loft conversion. Once this is done, the measured survey will begin. This is where the architectural designers will measure your home, and create existing as well as proposed plans for your loft conversion. The architectural designer would then make drawings within the 2 weeks of initial measured survey, and will work together with you to review and discuss your designs. Once the drawings are to your expectations, they will submit to planning. 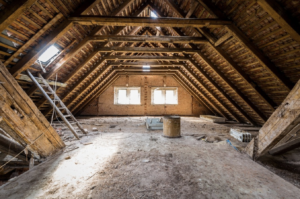 With most loft conversions, as long as it does not exceed the top of your existing roof, it will be put through to lawful/permitted development – click here to learn more about loft conversion planning applications. In simple terms, a party wall divides the buildings of two owners. The boundary between ownerships are usually, but not always, positioned at the centre of the wall. 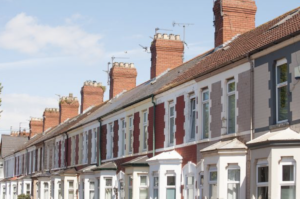 If the proposed walls share the boundary of a wall in the proximity on your neighbour’s property (semi-detached or terraced), a party wall agreement would be needed. Your neighbours will have to experience some of the pain of the work without enjoying the benefits of the new loft. Therefore, it is crucial to keep them informed. Legally, you have to give your neighbours some notice before starting any loft conversions that is close to their property. This would then move on to the process of selecting and appointing the main contractor for the build. At this stage, you have already had the required drawings and specifications to start with the build. A tender is a submission made by a supplier in response to an invitation to tender and it makes an offer for the supply of goods and services. You are the one who will be required to determine how you will procure the project by selecting your final contractor and getting a fixed price for all the constructions. However, some do not need to go through this process as they already have a builder in mind, maybe through personal contacts or good relations. Or maybe prefer to go with the preferred builder of the architectural designer. This allows for a better finish as they are already accustomed to the design style of the designer. Once everything has been finalised, your project can finally start taking shape! The build site is managed and insured by the contractors and the architectural designers can have scheduled inspection visits to ensure that all details are built to the drawings. Towards the end of construction, the architectural designers would conduct the final quality control inspection. Checking for any unresolved issues before any certificates are issued. For those with very little time on their hands, Gogo Studio can get your loft conversion on schedule. Creating a seamless journey from beginning to end.